Getting meals done in a hurry is a priority. I love cooking but sometimes I just don't want to do it. I've been turning to my crockpot more and more with the demand of school and work piling up. I don't just use the crock pot for meals but also meal prep. Instead of buying a rotisserie chicken or canned chicken for those nights I want a quick casserole, I use my crock pot. 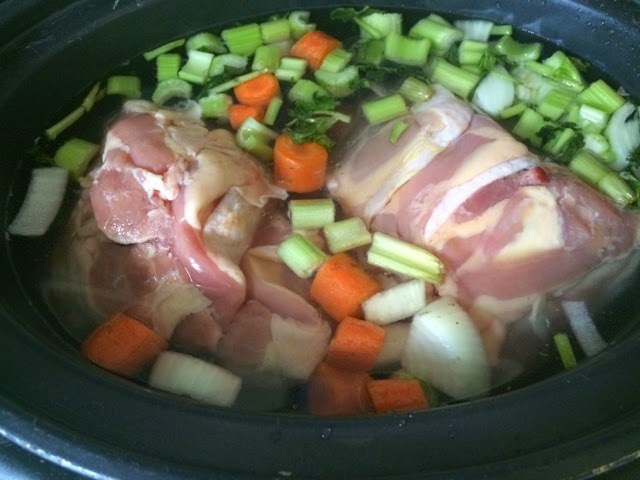 In the weekends when I have time (or at least pretend I do), I throw bone-in chicken breasts or thighs in to the crockpot, veggies, and cover with water. 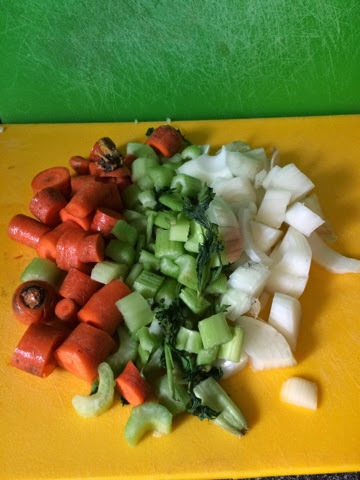 Sometimes I take the time to chop a veggie trio, but on really lazy weeks, I just throw in veggie scraps I've accumulated along the way. After covering the vegetables and chicken, I toss in some salt and pepper. It cooks on low for 8-10 hours. When I'm done, I have plenty of precooked shredded chicken ready to go in to vacuum bags in the freezer. Since most recipes call for 2 cups of chicken, I fill the bags accordingly. Now what to do with what's left in the pot? I set it in fridge overnight to allow the fat to come to the top and then remove it. At this point, I also strain out the vegetables and throw them away. I'm sure there's another use for them but honestly, I don't care for mushy vegetables. At this point I'm left with a big pot of chicken stock. The great part is the homemade stock is Gluten Free! I was shocked to learn some store bought stocks had gluten. I don't get the point of needing to add wheat to broth. Sort of defeats the purpose. For storing the stock, I recommend freezing it in ice cube trays first, then placing them in zipper freezer bags or using vacuum sealer.